His name is not the biggest in the game, but he has done some pretty entertaining things; accomplishments that will always have him listed in the MLB record books. 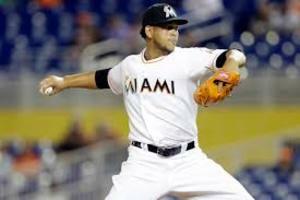 After some time away from the big stage, Henderson Alvarez signed a minor league deal with the Philadelphia Phillies. He made his first start with Triple A Lehigh on August 25 going five innings surrendering eight hits and two runs. Alvarez was supposed to be the next great Toronto Blue Jays hurler, but he never fully reached his potential until he was part of the blockbuster trade that brought the Jays Jose Reyes and Mark Buehrle while he was shipped off to the Miami Marlins. Coincidentally, this is where Alvarez came into his own. Prior to, he was treading water in Toronto sporting a 10-17 record. Despite throwing in the mid-90’s, he had an affinity for giving up the longball. In his first full season (2012), he gave up 29 home runs (9th in the league). While baseball people new his talent, it never truly became evident until the final game of the 2013 season when he threw the 282nd no-hitter in MLB history. If the no-no isn’t good enough, in 102 innings, he surrendered two home runs, a significant reduction from the previous year. His second season in Miami, Alvarez became the pitcher everyone knew he could be. He represented the National League at the 2014 All-Star game. His 2.65 ERA to go along with 12-7 record was good enough for 12th placing in the Cy Young voting. Over the past couple seasons, Alvarez has endured numerous arm injuries, injuries so severe that it limited him to 66 innings. There was even talk he would never pitch again. In 2017, Alvarez started his comeback with the Long Island Ducks of the Independent Atlantic League. After seven starts, it appears his right arm is getting back to normal. He’s posted a 2-1 record with a 3.94 ERA. In 32 innings, he struck out 13 and walked 14. That may not impress most, but to baseball people, they understand that he can still get guys out. It’s a shame that injuries derailed a career after only five MLB seasons, but at 27 years old there’s plenty of time for him to right the ship.